The liquid paints consist of purely natural materials - pigments together with a wax-resin emulsion. This contains linseed oil, beeswax, pine resin and styrax (the resin of the amber tree, which figures in the Old Testament as one of the four sacred incenses). As an incense styrax has a relaxing effect. When using the liquid paints you should take a bit of the coloured paste on the brush and dilute it with a little water - ideally in small glass containers with lids, in which the paint can be stored for later use. Paint that has dried can be reconstituted by just adding water. 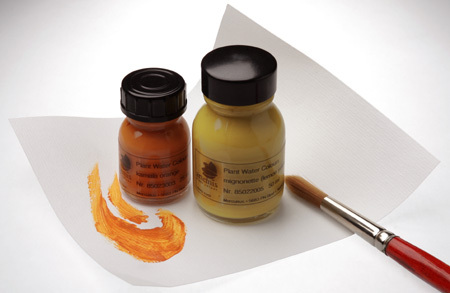 Watercolours from natural dyes 25 ml/0.85 fl. oz.